OR-7 was captured on a hunter’s trail camera shortly before migrating into California (A Daniels). The state of California is only beginning its wolf recovery story. 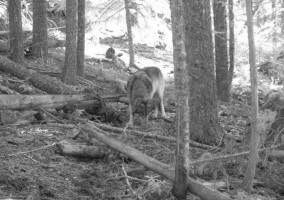 In 1999, Bob Ferris (former Cascadia Wildlands Executive Director) wrote an opinion piece in the San Francisco Chronicle speculating about the potential for wolves to return to California. In 2011 OR-7, now known as “Journey,” traveled to California from his birthplace in northeast Oregon as one of the Imnaha Pack pups. After spending nearly one year in California looking for a mate and a territory, Journey made his way back into Oregon and calls the wildlands east of Ashland home as of February 2014. Just as we need to work to keep wolves alive in Idaho to provide wolves for Oregon and Washington, we need to keep wolves protected and alive in Oregon to repopulate those areas in northern California still capable of supporting a viable population of wolves. OR-7 is a pioneer and we at Cascadia Wildlands will work to make sure this pioneer or subsequent pioneers have a future in California. Currently, stakeholders in California are working to create a gray wolf recovery and management plan, and on January 28, 2019, a judge upheld protections for gray wolves under the California Endangered Species Act! Stay tuned for exciting developments with wolf recovery in California. OR-7 and Wanda are Parents! !